The latest compound making its rounds in the rheumatology field is curcumin. Curcumin is one of several curcuminoids found in the popular Indian spice tumeric, commonly used to flavor curries and give it its yellow color. Used since 1900BC in Ayurvedic medicine, curcumin is currently being investigated for a number of diseases. Promising results have been found for curcumin for the prevention of Alzheimer’s disease as well as arthritis. 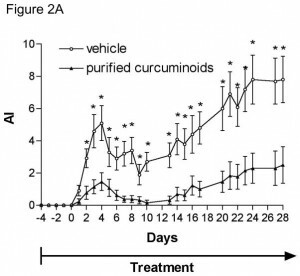 …purified curcuminoids may be safer and more efficacious for this use than complex curcuminoid-containing turmeric extracts. However, several caveats should be mentioned when extrapolating these results to clinical use. To our knowledge, no clinical trials in RA patients have yet been done to document the safety or anti-arthritic efficacy of specific turmeric products available for over the counter use. We are also not aware of any studies in animals or humans investigating the use of turmeric products for the treatment or prevention of other types of arthritis, such as osteoarthritis. The same study found promising results in the ability of curcuminoids to prevent the development of induced rheumatoid arthritis. In another controlled trial published in the Indian Journal of Medical Research, curcumin was compared to phenylbutazone (a NSAID) in patients with rheumatoid arthritis. 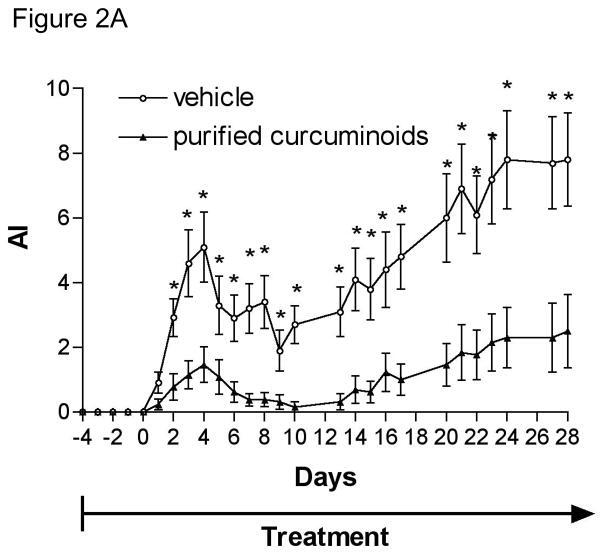 It was found that curcumin given at 1200 mg daily was effective in improving joint swelling, morning stiffness, and walking time. One more study published in the Journal of Ethnopharmacology treated a group of arthritic individuals with an herbomineral formulation with roots of Withania somnifera, the stem of Boswellia serrata, rhizomes of Curcuma longa and a zinc complex (Articulin-F). It found that treatment with the formulation produced a significant drop in severity of pain (P less than 0.001) and disability score (P less than 0.05). While the benefits were obvious in this study, it cannot solely be attributed to curcumin. In conclusion, there is sufficient evidence for the efficacy of curcumin to include it into our criteria when grading joint supplements. No we haven’t. You should look on amazon.com for a highly-rated curcumin supplement. I buy turmeric in the Indian grocery store and not as some brand in a bottle and its as pure and unadulterated as it gets when imported from India and sold as a spice to the immigrants. Indian grocery stores sell cheap turmeric that isn’t pure and has a low productions standard. “TurmericForce” is a good, organic brand supplement. Curcumin or Turmeric as spice(Plant)is natural means Healthyer and cheaper from ME,or Indian Markets. I have Found that the Organic Turmeric Ginger Spice of Life Green Tea from The Republic of Tea with a blend of Turmeric, spices, natural honey and fine china green tea is the addition needed to the top rated supplement recommended here on this site that I am going to try. It was missing the Curcumin. I drink a cup of this tea when I read each day. It was originally recommended by Dr Weil on his video for living a good life. (can’t remember the name sorry). He also endorses the salmon and tuna sources from Alaska caught and made into Vit d3 and Omegas from Vital Choice.